After Sun Cooling Gel: Aloe helps to soothe skin after a stinging, uncomfortable sunburn. Or it just helps to cool your skin down on a super hot day! Summer Shine Body Lotion: Not only is this lotion enriched with Vitamin A, it sinks into skin instantly and leaves behind the prettiest, most radiant shimmer. Seaweed Bubble Bath and Shower Gel: Lovers of bubble bath and shower gel, rejoice! This 2-in-1 contains sesame and carnation oils and seaweed extract to soften dry skin. This giveaway has a retail value of $78! There are three ways to enter. Here's how! 2) Like The Beauty of Life on Facebook and leave a comment on the Facebook post about this giveaway, telling me why you want to win this skincare set. This giveaway ends on Monday, August 20 at midnight. One winner will be chosen AT RANDOM on Tuesday, August 21. Maximum of THREE ENTRIES (one for each way listed above). Multiple entries will be disqualified. Giveaway is open to US residents only. I've yet to try this brand, but it looks like a good one! Thanks for the giveaway! I've never tried Mario B. but I would love to! I have always wanted to try this brand!! Thanks for another great giveaway...I would LOVE to try this product! I have been interested in this brand for some time. It would be awesome to be able to try it out. Follow on Twitter @brandyjoiner, FB as Brandy Curnutt-Joiner, and e-mail is brandyjoiner@yahoo.com. I would love this! They say the face lotion is really good. I first learned about Mario Badescu products when I worked at Nordstrom. I loved their cleansers and toners - I need to go back to Nordstrom and get some samples again! I love there products, they are so nice! Love this brand!! Use at least on of these products daily. I haer good things a Mario Badescu, haven't tried yet though. Awesome giveaway! Like many others, i have not heard of or tried this brand and products. But definitely would love to! I have read such wonderful reviews about Mario Badescu skincare products, but I have never had the opportunity to try them myself. I have mature, sensitive skin with a lot of oiliness and the occasional breakouts and I would love to see if they would work for me. Thank you, once again, Jamie! i love this brand! my skin needs this. I'd love to try these products. You get the best stuff! I love Mario Badescu and would love to try the Oil Free SPF 30 lotion! Thanks for the chance to win some of their great items! I've never tried Mario Badescu, but I would love to and these products sound like the perfect introduction! Thanks for the chance. Never tried Mario Badescu but it sounds like some good stuff! Mario Badescu products sound perfect for me. I would love to try them. I would love to try this product, I spend alot of time out doors, thanks for the chance! These products all sound like a great way to protect and refresh summer skin. I am excited about this giveaway. I have heard great things about the skincare. I have not used it yet. But I would love to and do a review on my blog. I remember receiving 2 sample sizes of Mario Badescu products and I fell in love with them, and as of this day I have purchased full size products and use them of a daily basis. I love the products and so does my skin. I love Mario products and I would love to win this contest! I got some free samples of Biadescu products about a month ago and thought they were great. This would be awesome to win! I discovered Mario Badescu back in November while traveling to Florida. I lived till February in upstate NY and now living in Texas. These products are the best so far for my skin and very affordable! I love using Mario Badescu products! My fave is also the Moisturizer with SPF 30 I live in FL with a lot of sun and that moisturizer doesn't make my face oily. Love it! I love Mario Badescu products! Thanks for the giveaway! 3 months ago Mario Badescu SAVED me from terrible acne. I will never choose another brand ever again. I've heard a lot about these products and would love to try them! I would love to try Mario Badescu skin care products. Thanks for the giveaway... Pick me!!! I love Mario Badescu products! I tweeted @aes529. thank you for the chance! This would be awesome to try thanks! would love to try these products! Greyandtabby at gmail dot com. The Summer Shine lotion sounds wonderful. these sounds awesome, thanks for the chance! I love Mario badescu! Best products ever! I have a slight obsession!!!! Oh I'd love to win this pack- what a great offer! I love Mario Badescu. I have purchased their drying lotion and it works great! I love their samples that came along with it and I know I would love the seaweed shower gel. I would love to win this. Thank you for the opportunity! I love that the moisturizer is Oil free. I like to try new skin care products. I would love to try Mario Badescu! I've heard of this product from my friends who say it is great! I really want to try it! I have always wanted to try this brand! I'd love to try this skin care line, especially the oil free moisturizer that even has an SPF because I so dislike any greasy feeling. I love Mario Badescu products (the Enzyme Cleansing Gel is fabulous). Thank you for this giveaway! I have never tried these products before, so I would love to win them. Yum would love to try! I have never tried this brand but would love to! I love this line, we sell it at my work, but its still pricey, even with my discount! I know that Martha Stewart loves the Mario Badescu line. I am a huge fan of their products! 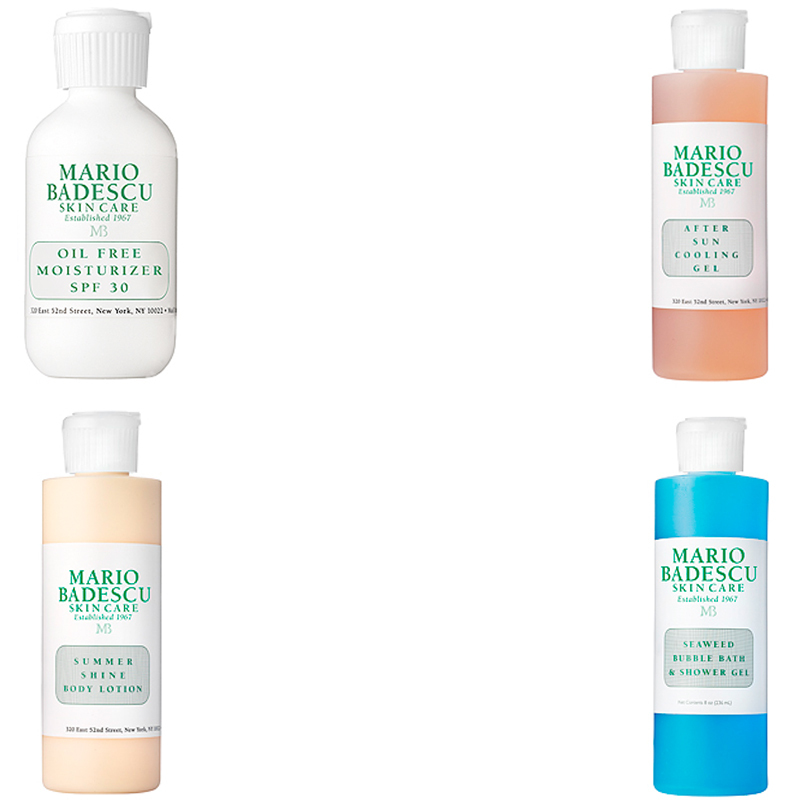 I would love to try the Mario Badescu products.